[G. Eric Rogers] is a radar-systems engineer who just happens to live within sight of the aircraft approach path for the local airport. We wonder if that was one of the criteria when looking for a home? Naturally, he wanted his own home-based system for tracking the airplanes. He ended up repurposing a motorized telescope for this purpose. The system does not actually use Radar for tracking. 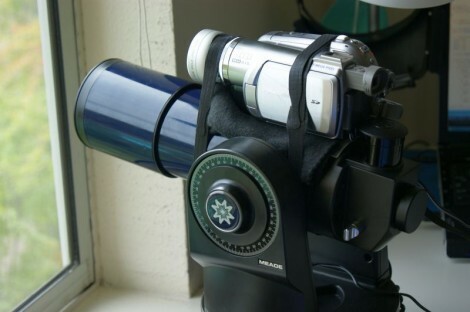 Instead, the camera strapped to the telescope is feeding a video experimenter shield. A tracking algorithm analyzes the video and extrapolates vector data. From there, the base unit can be controlled by the Arduino via an RS232 interface. There are some bugs in the system right now. The Arduino has something of an ADHD problem, losing interesting and going to sleep in the middle of the tracking process. [Eric’s] workaround uses the RS232 board to periodically reset the Arduino, but he hopes to squash this bug soon. It’s an interesting idea but it feels like he’s reinventing the wheel ever so slightly, there are already methods for tracking via a system called ascom and what he’s doing is really not very far off ‘auto-guiding’ where you use a pair of cameras to image an object using a star to ‘lock on’ to your imaging target. In this case the plane would be the ‘star’, there is even software that uses ‘features’ to track the moon via craters and such like, this could probably be used to guide on planes, if you can give it a direction and height you could work out roughly where to point the scope too. Yes, it is being done. But not with an Arduino! Visual tracking systems are kinda pricy … and here’s a nice inexpensive way to track ANY family of objects. The ADHD processor might be dealing with a stack over/under run (DAMHIKT) … those are really fun to find … especially when the offending code is infrequently called. you’ve certainly come to the right place…. If the arduino had something of an ADHD, it would start tracking squirrels in the middle of the tracking process. Instead it has a bit of a narcolepsy problem. That would make this project 20% cooler and 300% more charming. Oh SQUIRREL! Off topic but I’d say at least 25% cooler (esp. for the squirrel) Someone did exactly that, plus it only fires the water pistol if it’s a squirrel, and not a bird. Sorry no link. You could probably use the angle of the telescope and a range finder to plot the height and path of the object as well… I bet you wouldn’t get very interesting data out of it though. Maybe its not ADHD but Narcolepsy ? Rick, actually they’re not pricy at all :) You can use a webcam. software is mostly free too. Look for ‘phd guiding’, ‘stellarium’, ‘Daves solar system Recorder’, ‘ascom’ and for linux look at indi. No need to sniff the software, it’s all relatively open. There is also OpenPhd for linux too. I’ve ‘hand-tracked’ the iss with a motorised celestron scope but you can automate all kinds of things then use simple free software for tracking. As mentioned, focus is the bigger issue I can see on randomly fast moving targets, you’re going to want to look at motorising the focuser in some manner (I believe meade make a motor+controller unit for that scope!). I know most(all) of the stuff above is astronomy based but between ascom, stellarium and phd (looking at openPHD specifically because it’s opensource) you should be able to see the whole path of what’s going on, it’s a very short leap from PHD using a star to track with the scope to using blob recognition to track a plane (or any other object for that matter, could be entirely possible to use similar software to track people too). @Guy, any information you could feed the ‘guidance’ software would aid it in tracking rather than blind following, would possibly allow you to automate the system somewhat so you can switch from object to object so the scope goes to meet the object rather than you trying to chase it by hand to get it on screen. So where do I hook up the SAMs? I was talking about pure data logging, not really automation. But I who wants to know were planes are flying?